Some sun this morning with increasing clouds this afternoon. High 63F. Winds SW at 5 to 10 mph..
Mostly cloudy skies early, then partly cloudy after midnight. Low 41F. Winds light and variable. Yelm senior Tayelyn Cutler finds contact on a pitch in the 3rd inning against Timberline. 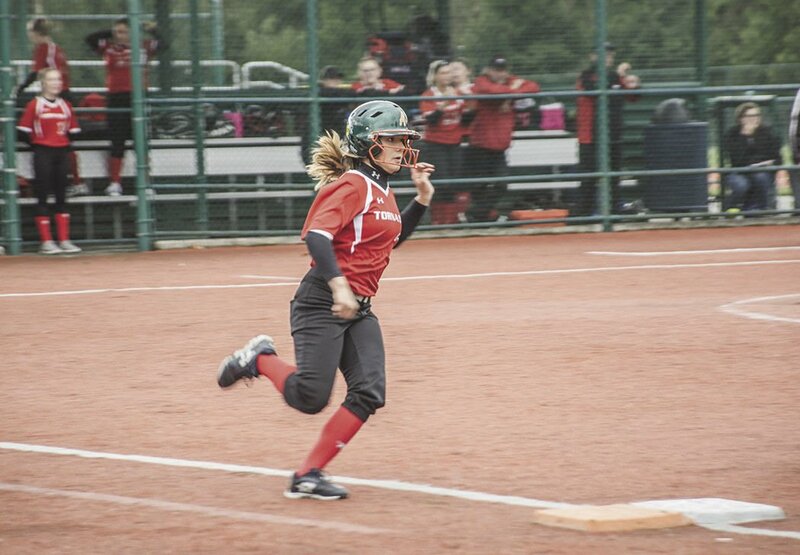 Yelm freshman Elena Castanon takes caution as she looks to advance her run past first base. Tornado junior Cydney Jarvis goes up to hi-five Calli Jesmer and Elena Castanon as they finish runs at the top of the 3rd inning. Junior Yelm pitcher Hailey Brown winds up a throw in the girl’s 2nd inning against Timberline. 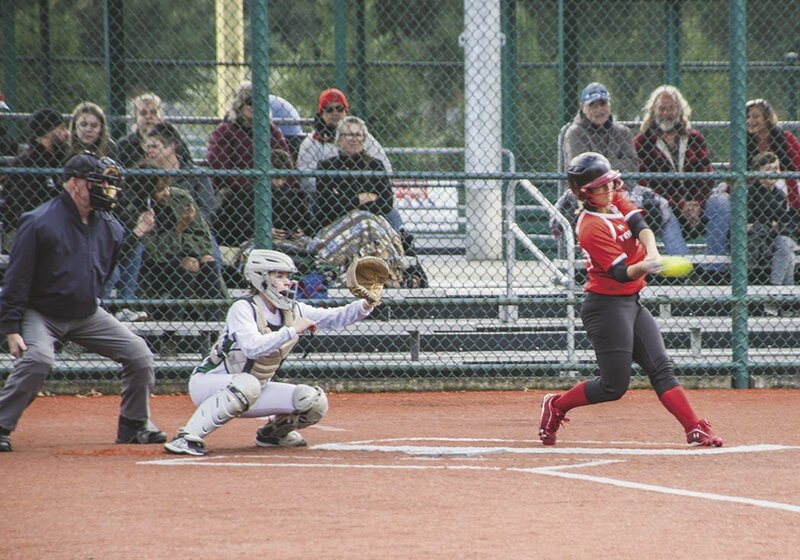 Yelm softball had an impressive outing against the Timberline Blazers Monday afternoon, bringing hits in during the early innings which led them to a 9-1 lead going in the 6th inning. The Tornados then fired it up in the 7th with seven runs to bring them a 16-3 win at the Lacey Regional Athletic Complex. “Nothing really caught fire until that last few innings. The last few innings we were hitting the ball really hard. What I was really please, with was... hitting the ball hard and taking the bases when we had the opportunity,” said head coach Lindsay Walton. The Tornados (4-0, 8-1) are still seated at No. 1 within the SSC 3A. Timberline (2-1, 5-2), formerly tied with Gig Harbor and Capital for No. 2, were kicked to No. 3. Results from Yelm’s Wednesday game against Gig Harbor were not available by presstime. Walton said their matchup against Timberline was all about finding consistency and momentum in those last few innings to bring Yelm the sizeable win they were looking for. The team were also very consist in their fielding throughout much of the game. Senior Taylor Gubser led Yelm in total chances, with 11, and found 10 putouts. Freshman Molly Embrey had six total chances with five putouts and junior Ashli Polzin had three chances with two put outs. Pitcher Hailey Brown threw a great game against Timberline. The Yelm junior pitched all seven innings, striking out 10 batters, and only allowing two errors and three runs. Gubser led the Tornados in runs, with three total. Freshman Ashlyn Aven, junior Maddie Plevyak and Polzin all took away two runs each. Looking toward the postseason, Walton said she definitely feels her team could compete well, given what they’ve already proved to the Y community. But at this point in the season, it’s still hard to gauge where they’ll land once districts are passed them. Walton also said the team currently has eight batters batting over .500. “The ones that aren’t batting are up in the 400 or upper 300,” she said. Yelm will face Peninsula this Tuesday, April 16, away.